Does the answer to increasing quad bike safety lie in lifting design standards or improving rider education? Strong support appears to exist for both approaches in public submissions for an Australian Consumer and Competition Commission investigation into quad bike safety. More than 50 submissions have been lodged from farmers, workplace safety consultants, quad bike manufacturers and dealers, industry associations and Government and workplace health and safety bodies. The ACCC inquiry is looking specifically at whether Australia should mandate specific design requirements and construction of quad bikes, including features that reduce the risk for children riding quad bikes designed for adults. It is also looking into whether a safety rating system and the testing of quad bike models before they are sold in Australia, and mandating safety warning information consumers would receive when buying a new quad bike. Of the submissions so far, about 80pc are in favour of mandatory design changes. But many also support improved rider training, point of sale material at sale, and the development of a five star safety rating system. Concerns have also been expressed that the ACCC inquiry could lead to prescriptive, overbearing rules that threaten the future of a useful tool on Australian farms. Several submitters said it is clear injuries and fatalities are caused by the riders, not the bikes. “I have been riding Quad Bikes for over 25 years without injury and am sick and tired of this issue being revisited on a weekly basis because someone expects manufacturers to “Idiot Proof” Quads,” one states. “Quad bikes are actually very safe if they are used in a responsible way in accordance with the purpose for which they are intended,” another wrote. In many cases the comprehensive safety warnings currently required on point of sale labels disregarded by users, some said. But a large number of submissions say design issues are clearly part of the problem. The National Farmers Federation said the promotion of safe user behaviour such as the wearing of helmets and active riding practices alone was not enough. 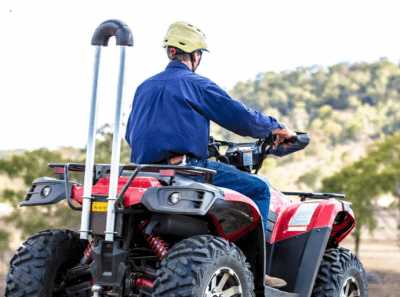 Transport and Road Safety NSW said a survey of 1546 workplace riders revealed that one in every two quad bike riders will experience a crash, and of those crashes, 70pc will involve a rollover. A commonly visited issue was children riding large quad bikes not designed for them. One submitter called for a clear distinction between bikes for racing or fun and bikes for agricultural work. “The newer models are a dangerous hybrid” they said. What design changes have been proposed? Submissions contain a wide range of design suggestions for ACCC to consider. These include mandating standards to ensure a low centre of gravity, wider wheel bases, stability alarms, driving assistance systems. Rollover Protection Devices (ROPS) or Crush Protection Devices (CPDs), prohibiting locked only rear differential, mandating a child lockout ignition system, requiring smaller seat sizes to stop passengers being carried on vehicles not intended to, improving thumb throttle design to prevent inadvertent sudden acceleration, limiting engine size and including speed limiters, reducing foot peg and footrest width, installing air bags on handlebars, limiting the size of sprayers allowed on quads, and required a universal crush protection device mount to be included on all new quads. Other ideas proposed included systems that prevent use of bike without a helmet being detected in close proximity, mandatory training for people who buy quad bikes, and banning children from riding quad bikes. Some argued that many of the proposed design changes could inadvertently lead to more injuries. Rollover Protection Devices could make it difficult for a rider to eject from the machine when it does roll. One wrote: “I have also heard of an incident of the rider forgetting about the ROPs sticking up behind them & ducking under a low tree branch, which clipped the ROPS & caused the bike to flip. A safety rating system could lull purchasers into a false sense of security, warned one submission. The Motor Traders Association of Australia warned that any introduction substantial quad bike design standards for Australian conditions could lead to manufacturers exiting the Australian market. The ACCC will be making a Draft Recommendation to government early this year, with a Final Recommendation to be made mid-2018.